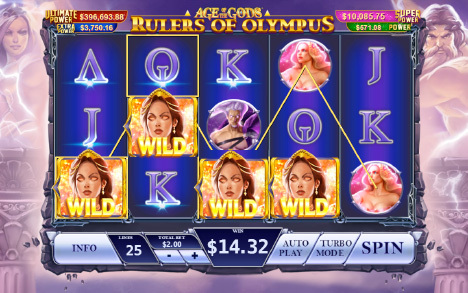 Age of the Gods - Rulers of Olympus is the newest slot game to arrive at Fly Casino. Rulers of Olympus is 25 payline game with the chance to get up to 50 lines during selected features. Shifting Wilds: There are two more types of wilds: Zeus and Hera. Each one acts as a shifting wild, with Zeus moving to the right each round, while Hera does the same to the left. Should they appear on the same row, they can trigger for you Battle for Power Free Spins. The Battle For Power: Free spins will have the shifting wilds battlingit out, delivering additional wilds between them. If Zeus is defeated, the feature will end. Free spin can be limitless. Olympus Free Spins: Triggers via an Olympus scatter on the 5th reel. You get 5x4 reels and 50 lines which will have up to 10 Zeus or Hera wilds locked for the entire duration. Thunderbolts Bonus also appears on the 5th reel. You’ll get 7 free games with up to 7 extra wilds are added to the reels. Age of the Gods Progressive: Of course, the biggest feature of them all is the FOUR network progressive jackpots that can be won randomly after any spin of the reels. 125% Bonus on Sunday from 00:00GMT until 23:59 GMT, all members on their deposit of just $/£/€30 or more will receive a 125% bonus up to $/£/€125. Double 75% Monday! From 00:00GMT until 23:59 GMT, all members on their deposit of $/£/€30 or more get a 75% bonus up to $75.00. Claim 2X. 135% Big Money Tuesday! From 00:00GMT until 23:59 GMT, all members on their deposit of $/£/€30 or more will receive a 135% bonus up to $135.00.